Zimbabwe's Prime Minister Morgan Tsvangirai has been forced to cut short an event where he was addressing Zimbabwean exiles due to jeering. 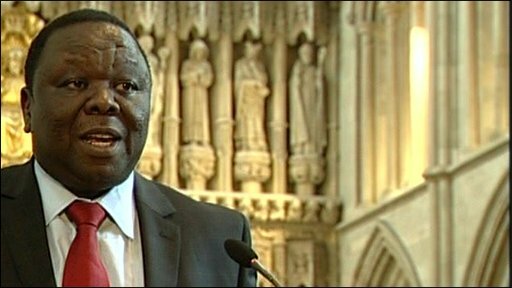 Mr Tsvangirai was addressing more than 1,000 exiles, whom he urged to return home to rebuild the country, during an event at London's Southwark Cathedral. But his appeal was poorly received as questions were raised over assurances he made about the country's stability. Mr Tsvangirai's UK visit is the final stage of a tour of Europe and the US. He has been seeking funding for the unity government he formed with President Robert Mugabe in February. Mr Tsvangirai, the leader of the opposition Movement for Democratic Change who became prime minister in the power-sharing deal, said the country needed the exiles' skills and money to help to rebuild Zimbabwe. During his speech, the prime minister said: "Zimbabweans must come home." He told the audience that improvements had been made through the creation of a "transitional" government, and that no-one had been "fooled" or co-opted. Referring to the power-sharing deal, he went on: "It represented the best solution to a crisis that has engulfed us as a people." The Zimbabwean prime minister said inflation had been cut, schools had reopened and previous scarce commodities were now available, adding that the government had "made sure that there is peace and stability in the country". That assertion provoked a noisy reaction from sections of the audience. He went on: "Our mission is to create the necessary space, the necessary freedoms for Zimbabweans. Our mission is to make sure that we give the people of Zimbabwe hope. "Zimbabwe is changing for the better, and that change is for you and me to ensure that we can build a Zimbabwe together." He acknowledged that no-one should forget the struggles and suffering of the Zimbabwean people, adding that he, as a victim of beatings and arrests, would be the last to forget the past. However, Mr Tsvangirai told the gathering that the plan to work towards a new constitution and referendum over the next 18 months was the correct one. The European Union still holds sanctions against Zimbabwe, and EU leaders have told the Zimbabwean prime minister they want to see improvements in the human-rights situation in the country before they consider lifting them. 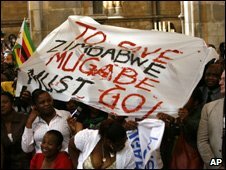 The Foreign Office in London has sounded a similar note, with minister Lord Malloch Brown saying sanctions would not be lifted until Zimbabwe's transition to democracy has "reached a point of no return". Mr Tsvangirai is expected to hold talks with British Prime Minister Gordon Brown on Monday.